The Kansas City lineman didn’t have nearly enough voicemail space on his phone for all the well-wishers. It’s what happens after you become the heaviest person in NFL history to run for a touchdown and throw a touchdown pass. Dontari Poe, who’s listed at 6-foot-3, 346 pounds, accomplished that just a couple of weeks ago. And it took him about that long to return all the missed calls. He had to put in work to smooth things over. He spent days thanking everyone who celebrated his improbable scoring pass — easily the most fun moment in a regular season mostly devoid of fun. Who wouldn’t get a kick out of watching one of the biggest guys in a sport full of biggest guys show off some quarterbacking skills? After all, football still is just a game. Some games, however, are more important than others. For the first time since the 2010 playoffs, Kansas City will open the postseason on its home field. The Chiefs play host on Sunday to the Pittsburgh Steelers in the AFC divisional round, with the winner advancing to the conference championship game. 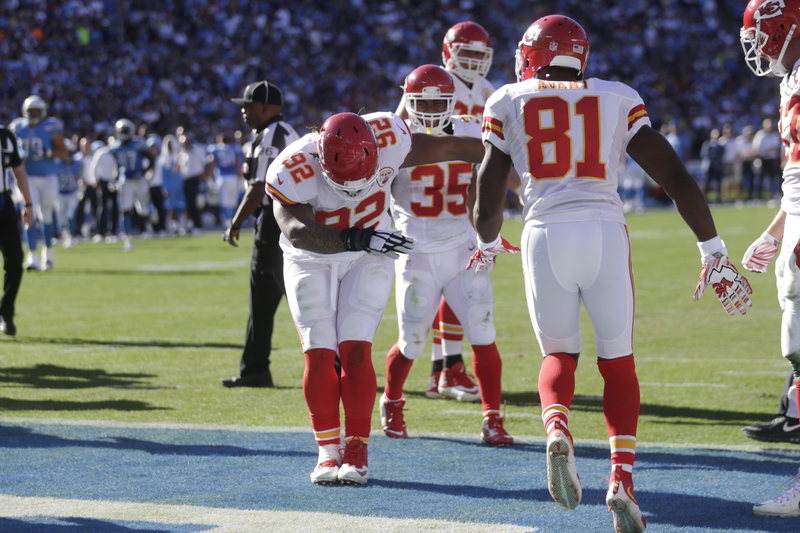 The Chiefs, who tied for the AFC’s second-best record, earned a bye in the previous round. They’re hoping that starting out on their turf will be a springboard to the Super Bowl, a game they haven’t played in since winning the Super Bowl championship after the 1969 season. So, yeah, it’s been a minute. Time to end the drought, Poe says. And he intends to do everything he can to make it happen. The most important player on the Chiefs’ defense will have a lot on his shoulders against the Steelers, who embarrassed the Miami Dolphins during their blowout victory in the wild-card round. Kansas City will rely on Poe to control the middle of the line and make it tough on Steelers superstar running back Le’Veon Bell to get going. That’s a big job. But, as we’ve learned from his highlights reel, Poe is a very big man. The Kansas City Chiefs’ Dontari Poe (No. 92) scores a touchdown during the first half of a game against the San Diego Chargers on Nov. 22, 2015, in San Diego. The suits back in the league office in New York benefited as well. The crackdown on on-field expression in 2016 left many fans hot about the NFL’s perceived rigidness. When players are being penalized for making snow angels, it’s definitely time to loosen up. Nothing in football makes fans smile more than watching giants (not those Giants) cross the goal line with the ball in their hands. That’s usually rarefied territory reserved for running backs and wide receivers on offense, and linebackers and defensive backs on defense. You know, the players generally considered to be the game’s best athletes. Linemen are merely supposed to slug it out up front. They’re there to help everyone else shine. When they take a turn in the spotlight, it’s just good stuff. It’s sort of like celebrating an achievement of a metaphorical little guy. It’s just that in Poe’s case, the little guy is massive. And when Poe scores, he feels like every defensive lineman who ever played enters the end zone with him. The Kansas City Chiefs’ Dontari Poe dances as he celebrates his touchdown during the first half of a game against the San Diego Chargers on Nov. 22, 2015, in San Diego. A former first-round draft pick, Perry struggled with his weight throughout his 10-year career. As a defensive tackle, he never fulfilled expectations. Poe, now in his sixth season, is firmly established as one of the NFL’s best defensive linemen. 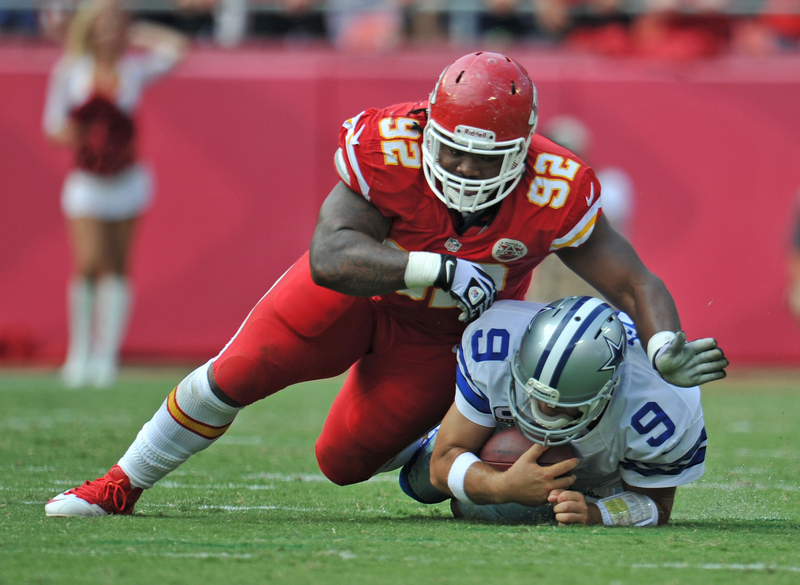 The two-time Pro Bowler holds it down at nose tackle, which is the key position in the Chiefs’ 3-4 base defense. The approach works best for teams that have a dominant nose tackle to occupy multiple blockers in the middle, freeing linebackers to make plays. Poe is well suited for the role. You won’t find a more athletic 300-pound-plus cat working the gig anywhere. — At times, why did Poe look so average on film? — Would Poe stay on the grind to become as good as possible? — And was he interested in being a leader? 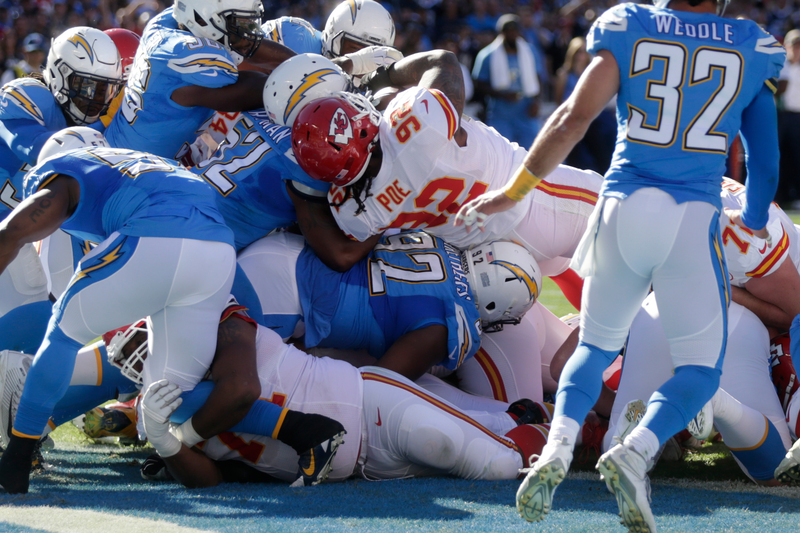 By reaching the Pro Bowl twice and continuing to stand at the front of the line of the Chiefs’ defense, Poe provided more than satisfactory answers. Poe doesn’t like to look backward. In his mind, there’s nothing there that can help him move forward. Still, he’s clearly pleased to have shown that “I let my play do the talking.” In Sunday’s rematch against Pittsburgh, Poe needs to shout louder than ever. Nose tackle Dontari Poe (No. 92) of the Kansas City Chiefs tackles quarterback Tony Romo (No. 9) of the Dallas Cowboys after a short gain during the second half on Sept. 15, 2013, at Arrowhead Stadium in Kansas City, Missouri. The Steelers methodically dismantled the Chiefs during their 43-14 victory Oct. 2 at Heinz Field. Ben Roethlisberger had five touchdown passes and Bell racked up 178 yards of total offense. Against Miami last week, Bell was even better. During Pittsburgh’s wild-card round rout, Bell scored two touchdowns and established a new franchise record with 167 yards rushing. That topped the mark Hall of Famer Franco Harris held for 42 years. When your name is mentioned in connection with one of the most beloved Steelers in franchise history, you know you’re rolling right. Poe gets that he and his dudes along the Chiefs’ line must ball out. That Chiefs will. It’s what they do. And regardless of whether Poe gets some run on offense against the Steelers, he could still have a ton of fun. Just as long as Kansas City winds up with a win.